The information on a marriage certificate gives a good starting point for tracking both the couple concerned and their parental families through census records. 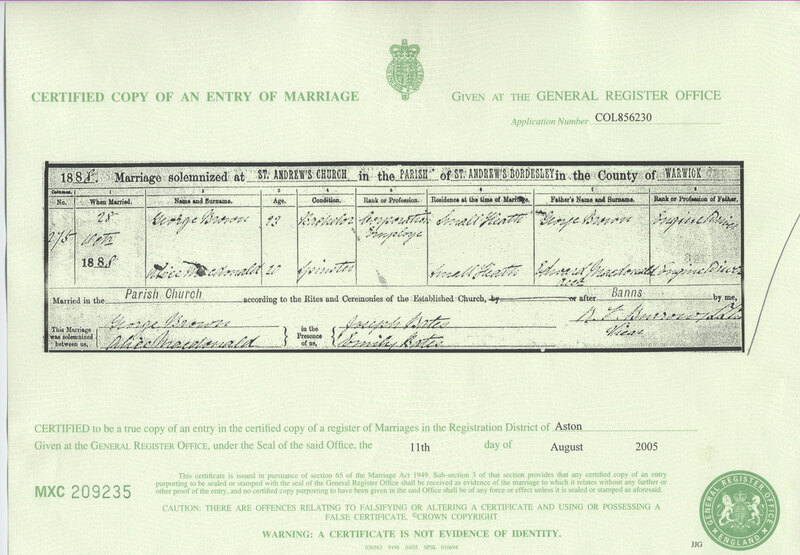 This week’s example in the 50 Marriage Mondays series is a General Register Office copy of the marriage register. The first census after this marriage was taken in 1891. It enumerates 3 members of the household at 5 Court 3 House, 41 White Road in the Bordesley Ward of Birmingham Municipal Borough and Aston registration district. Notice that Alice’s age does not tally with that given on the marriage certificate. Alice’s age is consistently reported on this and other census records, suggesting that she was born ca 1872, so was only 16 at the time of the marriage. Between 1865 and 1874, births of 11 Alice Macdonald/McDonald were registered, but only the January – March 1872 quarter recorded a birth in Aston which is local to Birmingham. Parental consent should have been required for her to marry as she was under 21. If there was an attempt to conceal her age, 21 should have been given to avoid any consent requirement. However, her father was deceased and the identity and status of her mother is not apparent from these two records. The presence of Arthur Macdonald, brother of Alice, helps confirm that this is the same person as on appears on earlier census. Working back in time finds Alice in her parent’s residence, 55 White Road, Bordesley in 1881. All were born in Birmingham. Edward and Maria Macdonald have not been found on the 1891 census. Five possible deaths for Edward Macdonald/McDonald of the right age were registered between 1881 and 1891, the most likely in the October-December 1887 quarter at Solihull. Maria could have died or remarried, either of which could have led to Arthur going to live with his sister. Only one death for a Maria Macdonald/McDonald of the right age was registered in the decade, in the July-September 1883 quarter at Worksop, and there were several registrations of marriages for people named Maria Macdonald/McDonald. Moving forward in time, the couple were at 45 White Rd, Bordesley in 1901. Notice the discrepancy in George’s place of birth, Little London rather than Spalding. There are 4 places named Little London in Lincolnshire. However one is in Spalding, marked at one end of Hawthorne Bank, so the George’s place of birth and home in 1881 were certainly very close if not the same house. By 1911 George had died leaving Alice with 3 children at 45 White Rd, Sparkbrook (same address as 1901 as Sparkbrook is in Bordesley ward). This schedule also includes a lodger, Alfred Dean from Gedney Drove End, Lincolnshire and reveals that Alice had another child who died prior to 1911. Discrepancies between the census and civil registration information have been resolved sufficiently for me to reach a preliminary conclusion that Alice’s parents were Edward and Maria Macdonald of Aston, and George’s parents were George and Hannah Brown of Spalding. General Register Office. Certified copy of an entry of Marriage (Marriage certificate). RD Aston. Warwick, St Andrews, Bordesley, no 275. issued 11 August 2005. George Brown & Alice Macdonald, 1888. Census. 1891. England & Wales. Warwick, Aston, Deritend. RD 39, image 22. Brown, George. Available online ancestry.co.uk . Census. 1881. England & Wales. Warwick, Aston, Deritend. RD 39, images 20-21. McDonald, Edward. Available online ancestry.co.uk . Census. 1911. England & Wales. Warwickshire, Aston. RD 34, page 1083, schedule 183. Brown, Alice. Available online ancestry.co.uk .